Mental Health Awareness Week 2017: 8-14 May. This week is Mental Health Awareness Week, with the aim to increase awareness and end the stigma surrounding mental health. Mental health has been a source of fear and misunderstanding for centuries. The spectre of the ‘Mental Health Asylum’, created by the Victorians, is still part of living memory, even though these institutions have been largely closed since the 1960s and replaced by ‘Community Care‘. However, it is debatable whether the current infrastructure is the best to help and support the most vulnerable members of our community. Mental Health has traditionally been an area which has not received the same attention as physical health. In fact, it has actually been seen as a weakness to acknowledge that one is struggling with a mental health or emotional problem. Unfortunately, stereotypical images of the ‘mad person’ abound, the man or woman who is separate from mainstream society, the ‘other’ to be feared and even ridiculed. However, with thanks to contributions from influential people such as Prince Harry and the Duke and Duchess of Cambridge, we are starting to see beyond the stereotype. It is estimated that 1 in 4 people suffer from a diagnosable mental health condition. Indeed, this figure may well be higher in geographical areas which have poor housing, poverty and/or high unemployment levels. 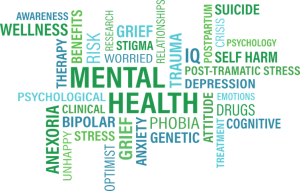 As with physical problems, mental health issues cover a broad spectrum, ranging from: mild depression or anxiety; to psychosis and schizophrenia. The causes of these problems can also be wide ranging, especially when one remembers how society has significantly changed over the past fifty years. Unfortunately though, access to a range of appropriate help and support arguably does not equal the scale of need, especially within mainstream services. See “Surviving or Thriving? The State of the UK’s mental health“. As part of the 2017 general election campaign Theresa May recently pledged that, if elected, her government will recruit another 10,000 mental health workers to work in the NHS by 2020, in addition to increasing schools counselling services and instigating an overhaul of the Mental Health Act (1983). However, it was also reported that there was actually a drop of 6,610 mental health workers in the NHS between 2010 and 2016. These measures are to be welcomed, but are arguably only part of a much needed and ongoing change in attitude, understanding and resourcing of Mental Health. This change is desperately needed. enables people to find the right source of help and support that is appropriate to them. Your first port of call is your GP. Firstly to check to see if there is a physiological condition contributing to how you are feeling, and secondly, to find out what is available to you via the NHS. If you are worried about a child, see if there is a counselling service available at their school (e.g. Place2be). Look at ways in which you can help yourself cope with your day to day fears and anxieties. Charity websites can be an important source of help and support (e.g. MentalHealth.org.uk, YoungMinds.org.uk, Mind.org.uk). Find a therapist that you feel comfortable talking to. Although there are recommended types of therapy for different kinds of problems (see Nice.org.uk), arguably the relationship that you have with your therapist will be the most important factor leading to change. Check out the websites for professional bodies for further information (see BACP, Psychotherapy.org.uk, bps.org.uk). It is to be applauded that we are now talking about Mental Health in positive terms. Let’s ensure that Mental Health remains at the forefront of the debate for awareness and resourcing; and that the positive changes we have seen are continued. Good mental health is everyone’s right and no-one should suffer in silence. ← ‘Tis the season to be jolly …’?